Brown was one of several candidates to stop by Hillsboro's Moms Demand Action meeting last Friday. Oregon Gov. 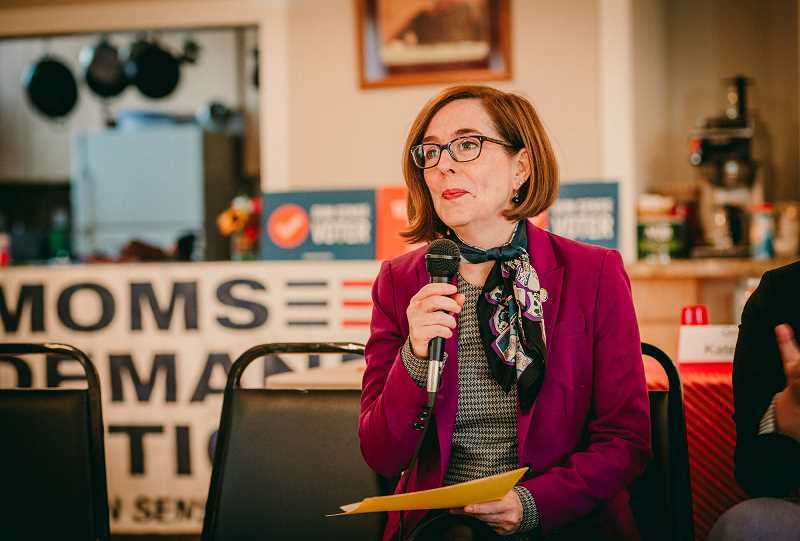 Kate Brown made a quiet trip to Hillsboro last week to speak before voters at a candidate forum aimed at promoting statewide gun reform. On Friday, Oct. 12, Brown and a handful of other progressive legislative candidates on this fall's ballot stopped by downtown Hillsboro's Tuality Masonic Lodge, 176 N.E. Second Ave., for a political meet-and-greet organized by the Hillsboro chapter of Moms Demand Action for Gun Sense in America. 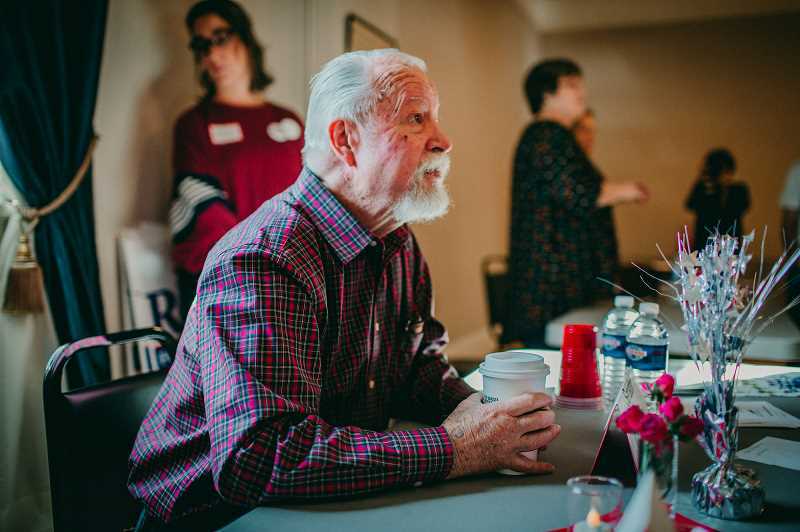 It was a different kind of political event, with more than 60 attendees sitting down with the candidates one-on-one for conversations for a morning described as "political speed dating." Moms Demand Action meets monthly in downtown Hillsboro. The group has seen a large number of new members since a school shooting in Parkland, Fla. The candidates at Friday's event each support gun-violence prevention measures, such as mandatory background checks for all gun sales. Each of the candidates, including Gov. Brown, have been endorsed by Moms Demand Action and Everytown for Gun Safety for their stances on gun reform. Brown led a charge last year to close the so-called "boyfriend loophole" which allowed people convicted of domestic abuse to own firearms if they were not married to the victim. Organizers hoped the format would encourage people to be more involved in the election, either by voting or canvassing for candidates they support. "We hope voters will come away inspired to vote and to do all they can to elect candidates who support common sense gun reforms," said Hilary Uhlig, who leads Hillsboro Moms Demand legislative and elections projects. "We hope voters will understand what candidates' priorities are and begin to think about how they can be engaged through the Nov. 6 election and beyond in promoting gun safety measures." Brown is in a hotly contested race against Republican State Rep. Knute Buehler. Uhlig said Brown's thoughts on gun reform are in line with her organization's principles. "Under Gov. Brown's leadership, Oregon closed legal loopholes to prevent all convicted stalkers and domestic abusers from buying and keeping guys, enacted the Extreme Risk Protection Order that empowers courts to order guns removed from individuals who pose an imminent risk of violence to themselves or others, and enacted legislation requiring a criminal background check on every gun sale in Oregon," Uhlig said. Brown has also called for closing the so-called "Charleston loophole," which allows gun sales to proceed when background checks cannot be completed within a three-day timeline. Also attending Friday's forum were State Sen. Chuck Riley, Rep. Janeen Sollman, Rep. Susan McLain, state Senate candidate Sarah Grider — who is hoping to unseat Kim Thatcher in Senate Dist. 13) — and Courtney Neron, a former teacher running against Rich Vial in House Dist. 26. Everytown formed in 2013, when Moms Demand Action merged with Mayors Against Illegal Guns. Moms Demand Actions works as the the grassroots arm of Everytown.